8th Ave. and Oak St.
Park Blocks are a buzzing urban plaza in the heart of downtown. You will find folks enjoying lunch on the plaza at one of the many food carts during their busy work days. 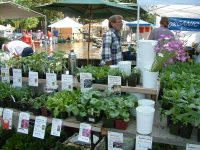 It is also the home to farmers markets and the beloved Saturday Market. Contact the Facilities Division at 541-682-2690 for more information.